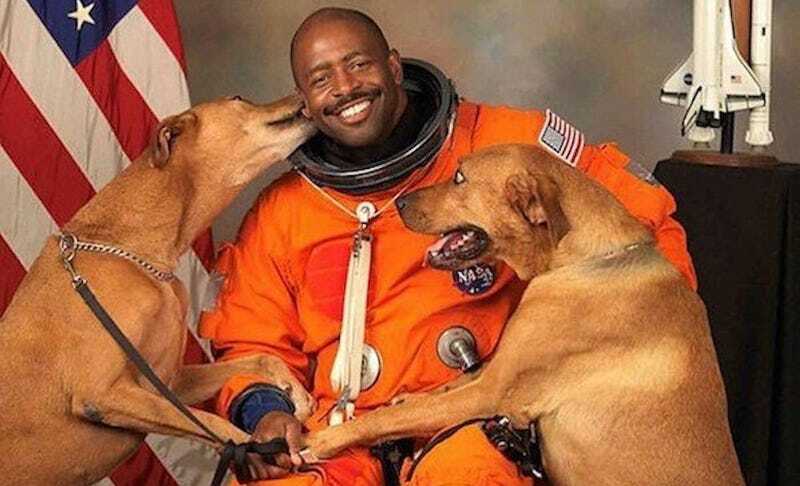 Leland Melvin is a star in every sense of the word. The retired astronaut, NFL draftee, and literal dog whisperer has a resume most of us could only dream of. Now, he can add “bringer of internet joy in these dark and troubled times” to that very long list of accolades. 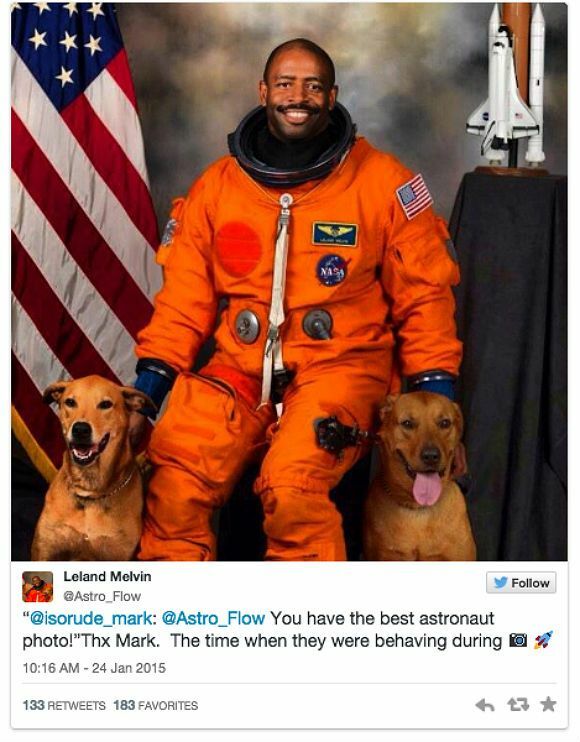 Recently, the unofficial Rogue NASA account tweeted one of Melvin’s official NASA photos, which can only be described as the most wholesome thing since cookies and kittens, except with puppies. The photo has made Twitter rounds quite a few times, proving itself a perennial favorite for obvious reasons. Melvin, who has spent over 565 hours in space throughout his career, made his first trip to orbit in 2008 aboard the Shuttle Atlantis. His second mission was in 2009 on board the 31st shuttle flight to the International Space Station (ISS). A life-long Trekkie, educator, and advocate for blending science with the arts, he has been called the “Coolest astronaut in the galaxy” for good reason. When he got to Studio 8 at the Johnson Space Center, Melvin took Jake and Scout up the back stairs and into photo-shoot area. And thus, the most perfect of portraits was born. Long before the photo, it was clear these three were destined for each other. After rescuing Jake first, one Thanksgiving day, Melvin found Scout in his yard. “I was cooking a turkey and Jake was right beside me waiting for something to drop, and my neighbor came over and said, ‘Leland, Jake’s in the front yard.’ I was confused because Jake was next to me,” Melvin said. “I went outside and there was this dog in my yard. So I brought him in, and he had no collar or tag. No one claimed him…I think someone might have dumped him because he had heart worms.” So Melvin nursed him back to health, and the trio were inseparable from that day forward. Since then, both Jake and Scout have passed away, due to old age and lymphoma, respectively. Though saying goodbye was hard, Melvin says the happiness of those years will last a lifetime.